This fall, Vassar’s Frederick Ferris Thompson Memorial Library played host to the U.S. premiere of Ulysses Cylinders, a stunning exhibition by renowned glass artist Dale Chihuly. Titled Ulysses Cylinders, the exhibition narrates the 18 episodes of James Joyce’s book through the use of images—created by glass threads—fused with 24-karat gold leaf into colorful glass cylinders. Shades of gold, green, and red vibrantly glow as natural light from the leaded windows reflect off the gold leaf. Leslie Jackson Chihuly ’83, Dale Chihuly’s spouse and president and CEO of Chihuly Studio and Chihuly Workshop, says the artist holds dear both Ireland and Joyce. “In his travels there, he had such an admiration for the people, the music, and the literature. This particular book was so controversial, and the depth of the story and the subject matter really conjure up some strong visuals. I think it lends itself to a visual presentation,” she says. 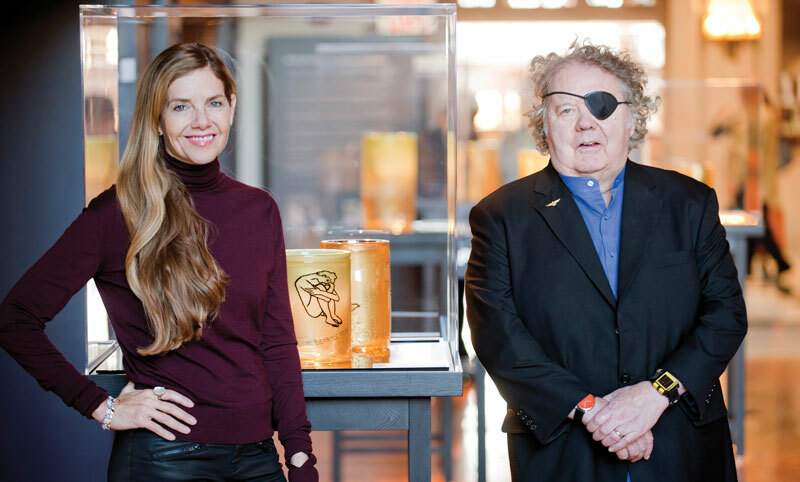 The project brought together the work of Chihuly and long-time friend and artist Seaver Leslie; the two first worked together in 1975 on a similar project, Irish Cylinders, which featured works with images of Joyce and the author’s native Ireland. Then at the Rhode Island School of Design, Chihuly used a new technique to fuse glass thread “drawings” into cylindrical vessels while they are in a molten state. “The cylinder form is a recurring constant in my vocabulary as an artist. The form itself is neutral, like a blank canvas, on which the drawing on the surface is suspended. The cylinder both supports and contains the action of the drawing,” says Dale Chihuly. On their way to Ireland in 1976 to exhibit the as yet unfinished Irish Cylinders series, Seaver Leslie and Chihuly were involved in a horrific auto accident, which left Chihuly hospitalized for months and eventually led to the loss of vision in his left eye. Work on Irish Cylinders took a back burner to other work until 2013, when the subject came up in a discussion between Leslie and Chihuly. It didn’t take long before the two began the new project, this time with a focus on Joyce’s tale of a day in the life of Dubliner Leopold Bloom. “In the summer of 2013, when Seaver and I decided to revisit this body of work, I had to refresh my recollection of Ulysses. I remember thinking that the characters and various scenes would provide us with a great deal of thematic material to work with,” Chihuly says. For the project, artists Flora C. Mace and Joey Kirkpatrick—who taught at Chihuly’s Pilchuck Glass School in Stanwood, Washington—created and fused glass drawings derived from Leslie’s pen-and-ink works. The 45 cylinders were then crafted by Chihuly and his team at the school he cofounded. The height and diameter of each piece is unique, with some more than two feet tall and others more than 12 inches in diameter. “The sizes were determined both by the actual sizes of the drawings themselves, but also by the idea of presenting them in groupings. How my works inhabit a physical space is a very important consideration in all of my work, whether it is a 20-foot or 12-inch-tall cylinder,” Chihuly says. 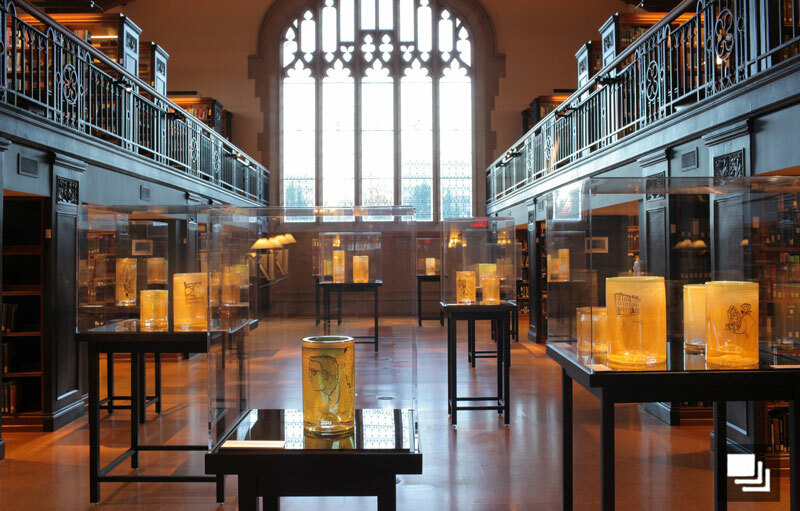 Vassar is the first U.S. college to present Ulysses Cylinders, and the Thompson Library—consistently listed as one of the most beautiful college libraries in the world—is an ideal location, Chihuly says. The lighting, the books, and the organic feel of the library all work together to highlight the exhibition and the story the cylinders tell, he notes. “The show presents so wonderfully in an academic setting such as Thompson Library. I’d love to see it travel to other colleges and university libraries,” the artist says. Along with the cylinders, the exhibition includes a photo-rich catalog with essays by art experts Róisín de Buitléar, Conor Farnan, and Audrey Whitty. Mounting the exhibition gave Vassar an opportunity to show off its own collected editions of the author’s work in the exhibition James Joyce’s Ulysses: Text and Art. The accompanying show spotlighted editions of the novel illustrated by acclaimed artists including Eric Gill, Henri Matisse, and Robert Motherwell.